and cardboard tubes, made to fit. 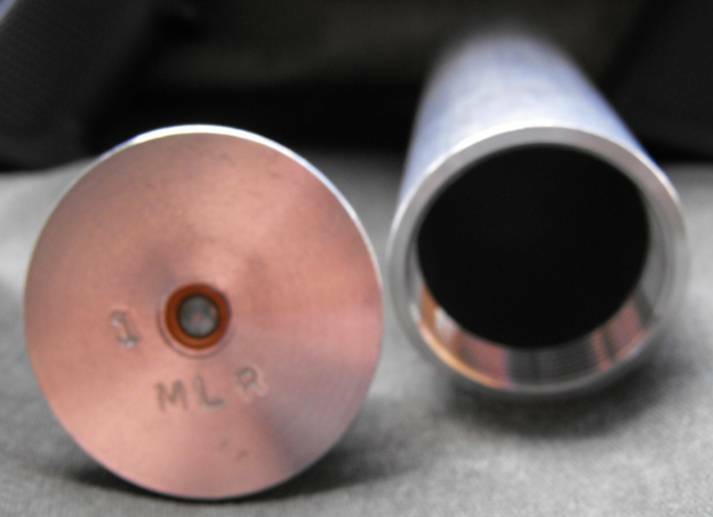 This review is on the newly developed 37mm black powder casings manufactured by MLR Distributing LLC. The casing is made of 6061 aluminum, the sidewalls can be made in any length desired by the customer, and are extruded aluminum. The bottom .470” of the tube is threaded to accept a machined base that holds the up to 35 grain black powder charge and a #209 shot shell primer. The bases can be ordered in different capacity, for different power options. Above you can see the powder chamber, primer, and threaded base, as well as the inside of one of the sidewall tubes. The sidewalls of the casing are .130” thick, and have an OD of 1.495”, and an ID of 1.240”. These are beefy casings. MLR also supplies cardboard tubing that fits these casings perfectly in fused or un-fused. The base portion of the casing is CNC machined to perfection. Threads are sharp, and well cut. The powder charge portion is .750” ID, and .400 deep, to the top of the #209 primer. 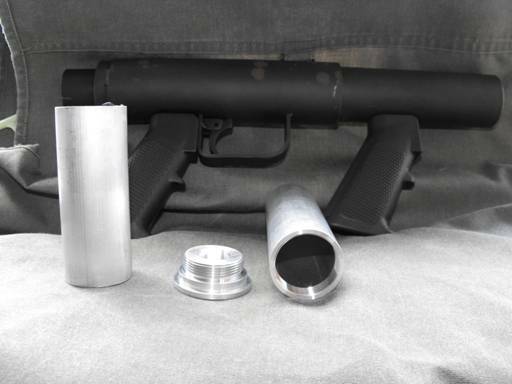 This size powder chamber will hold a 30-35 grain charge of fffg American Pioneer black powder substitute, but could be made to your own specs to increase that power. The sidewalls of the powder chamber are .250” thick. This will contain the charge adequately. The rim of the base portion has an OD of 1.725”, and the rim is .120” thick. The base is .695” tall. When I receive casings for review and testing, I mark them as in the above photo, to keep track of loads fired from this particular casing, and performance notes. Mark Rogers from MLR, the same manufacturer of the “Slam Fire” launcher, provided me with 4 casings to test and evaluate. Two of them were 5” and two were 3.720” tall. He also provided 4 cardboard tubes, OD 1.230”, ID 1”, and 3” in length, with 8 fused cardboard end plugs, and smaller plugs for the casing bases. 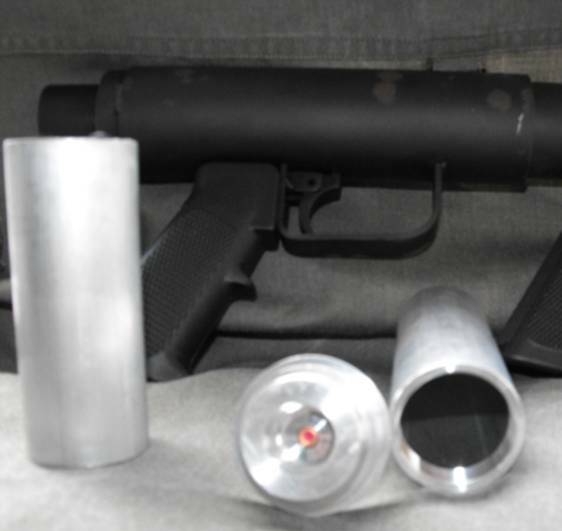 The interior of this casing is ready to be loaded with a powder charge, and projectile. I loaded one of the short casings with 20 grains of American Pioneer fffg black powder substitute. The other was loaded with 30 grains. Both smoke marker projectiles were then loaded into the casings. The cardboard top cap does not fit into the casing, so it rests on the top of the casing. I used four small dabs of RTV to hold the smoke marker in place in the casing. The rounds were allowed to dry and set for a day before the test. The tubes fit tight enough in the casings that you do not need an interior wad over the black powder. Make sure the fuse is in direct contact with the powder. Both rounds were fired using Mark’s Slam Fire 37mm launcher. Both rounds functioned perfectly. The 20 grain projectile achieved a range of 100 yards. The 30 grain projectile traveled 125 yards. The green smoke mix ignited shortly after the munition impacted the ground. The smoke marker projectile functioned flawlessly, and contained an impressive amount of smoke. The munitions burned for over a minute each! Mark’s casings are very dependable, and easy to reload. The removable base is a very handy feature for the reloader. It will allow you to use various length sidewalls with a limited number of bases. You can now purchase the exact tube sizes you will need for the payloads YOU want to launch. No more need to buy and modify! These are made to your specs. If you want muzzle blast, order the long sidewalls. Buckshot? Short sidewalls. You want options? Order a couple bases, and a bunch of different length sidewalls! Also, the removable bases allow you to perfectly seal your projectiles FROM THE INSIDE! No more goopy hot glue, or exposed RTV. Seal them from the inside, then screw them to the base. Got some things loaded and want to try something else? No need to fire them off, just unscrew them, and use a different sidewall. Keep in mind, these are black powder casings, and require cleaning and lube after every use! After firing, remove the old primer, and use hot soapy water and a scrub brush to clean the casings very thoroughly. Give them a light coat of oil before storing them. Check on them from time to time to make sure no residue remains. Although aluminum casings will not rust, they will corrode when left with black powder residue inside them. 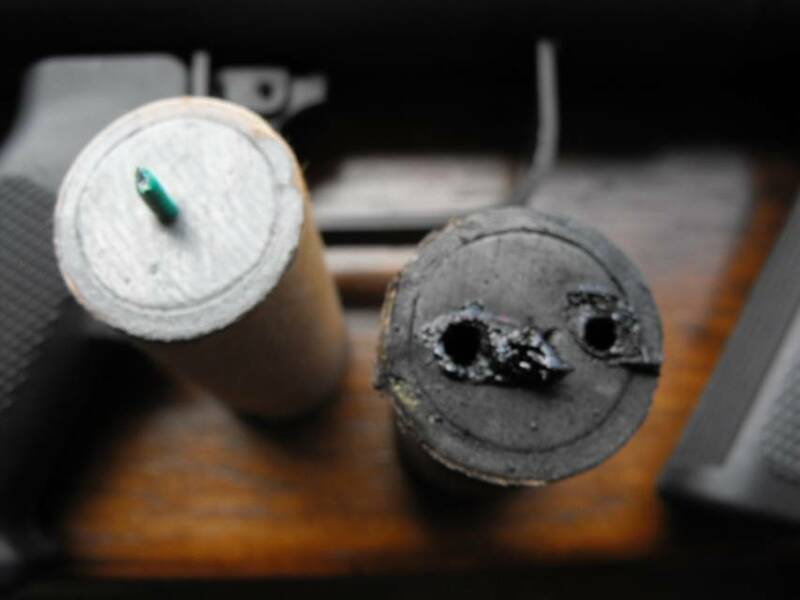 Always clean your launcher well right after firing any black powder casing, even when using black powder substitutes. 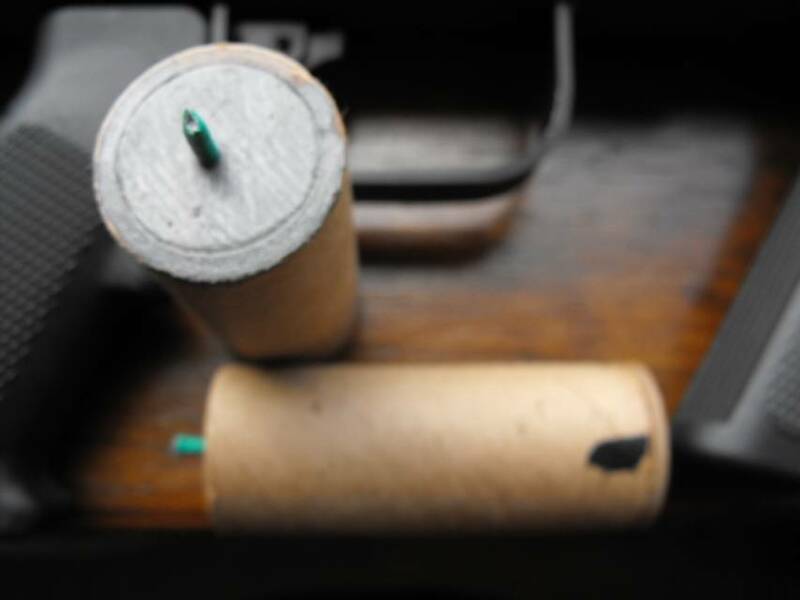 In order to use these casings in a survival situation, I would recommend sealing the primer area with Nitrocellulose lacquer (fingernail polish works well), and using blue locktite or a small dab of silicone on the threaded base to waterproof that area. The top end of your projectile can be dipped in latex paint to provide a good positive waterproofing so your powder does not get damp should you and your ammunition get wet. 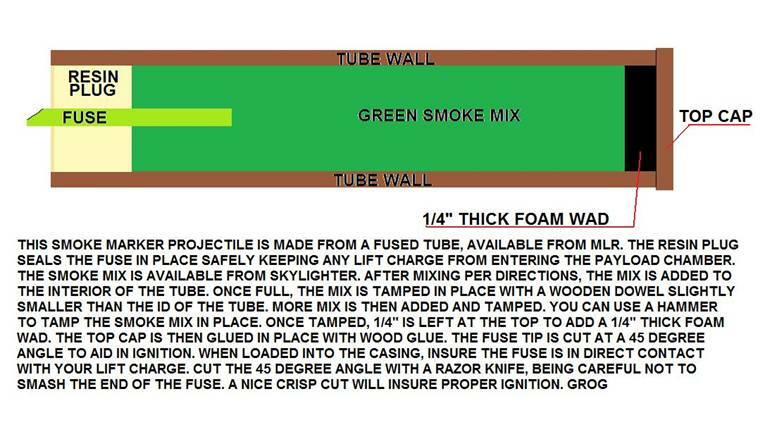 The casing tubes can be loaded with any common star clusters or pyrotechnic mixture commonly used in distress signaling. With over a minute of smoke generation, it gives you plenty of time to be seen from aircraft or ground search parties. When it comes to survival situations, these casings, and the Slam Fire launcher, will never break and/or let you down when loaded and stored properly. ad with member discounts once review is done. tubes as they want and mix and match as they wish. nicely. Pricing will be forth coming on them. - 3 inch cardboard tubes $1.00 each or 12 for $10. - Plugs for tubes are 25 for $5 or 100 for $15.00. Please visit Mark’s site here: http://www.mlrdistributing.com for ordering, or contact him through our discussion forum.